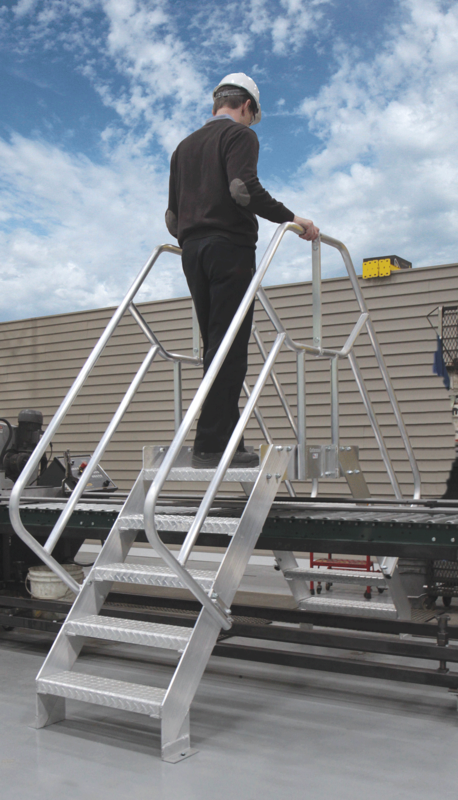 Cotterman® Crossover Bridges provide safe walkways over a variety of obstacles such as conveyors, machines, and pipes. Crossover Bridges are available in Steel or Aluminum. 50° climb angle, with 8″ step rise. 42″ Handrals, constructed of 1-1/2″ diameter round tube. 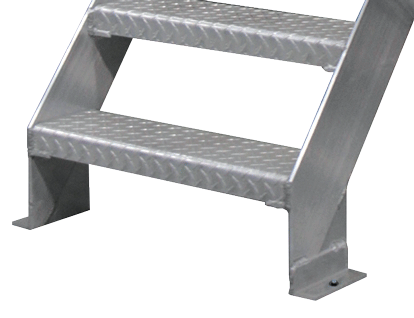 Stair sections have 24-1/8″ wide by 4-7/8″ deep steps. The top platform includes a 4″ high toe board on each side. Legs have floor mounting plate with 5/8″ diameter hole. Serrated or Diamond Plate steps. Gray powder coat finish is standard on steel models. Aluminum is a brightened, uniform finish. Crossover Bridges meet applicable OSHA and ANSI standards. Gray powder coat is the standard finish (Steel). Brightened aluminum finish (Aluminum). Classic, trustworthy grip. Ideal for dry, indoor environments..
With 5/8″ diameter hole. For bolting the Crossover Bridge to the floor and ensure proper footing. The approximate height that a person would stand while on the bridge. 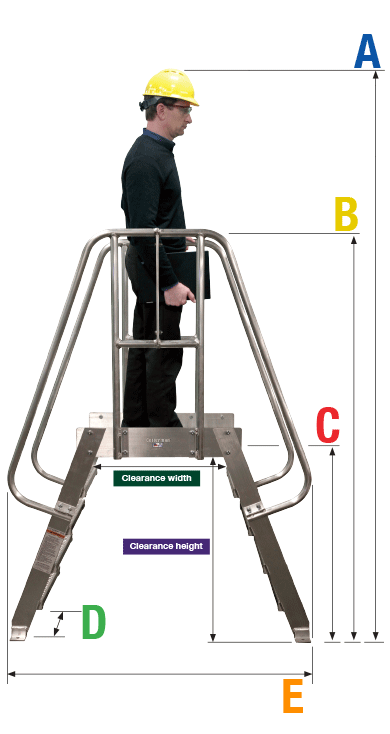 You will want to be sure that the user can stand comfortably on the platform without obstruction. We calculate this at 6 feet, but individual standing height will vary. is the measurement between the floor-mounting brackets. This is dependent upon the height of the bridge. The taller the bridge, the longer the overall length. Lower clim angles also increase overall length..